Faf du Plessis and Imran Tahir surely miss the first match. Shane Watson will open the innings along with A Rayudu. Virat kohli lead this side. No injury concern shown in their team. Parthiv Patel is likley open the innings along with Virat Kohli. 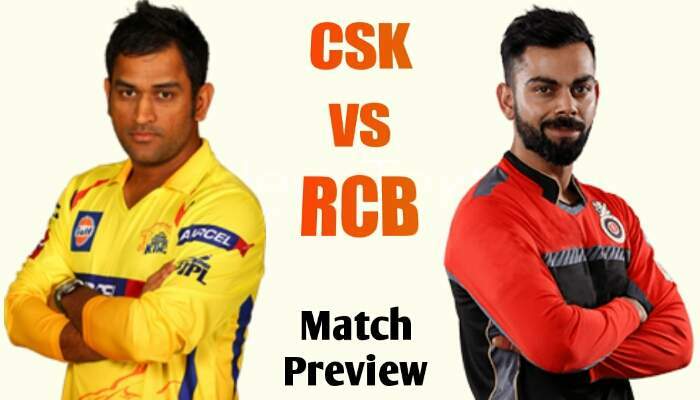 Either Sundar or Negi will play this match. Shane Watson, Ambati Rayudu, Suresh Raina, MS Dhoni, Kedar Jadhav, David Willey/Sam Billings, Dwayne Bravo, Ravindra Jadeja, Shardul Thakur, Mohit Sharma, Karn Sharma/ Mitchell Santner. Parthiv Patel, Virat Kohli, Shimron Hetmeyer, AB de Villiers, Moeen Ali, Shivam Dube, Pawan Negi/Washington Sundar, Tim Southee/H Klaasen, Yuzvendra Chahal, Umesh Yadav, Mohammed Siraj. In Wicketkeeper Parthiv Patel, MS Dhoni will be the safe option, you pick anyone of them but Parthiv Patel is the safest option bcause he open the innings and get more chance to score for his team and gain points for you. MS Dhoni will play at middle batting order but you can try him in grand league as less users pick him due to his batting order. Make balance team because both the teams are attacking and most promising in the IPL format. But as per trust value, users have more faith in Chennai Super Kings due to their outstanding winning performance in every season of the IPL.